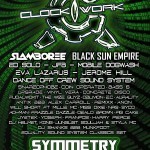 Symmetry festival returns for 2015 ! Moving forward in our journey @ Sennowe Park as we explore new territory. Expect a visual spectacular with performing arts, live acts, DJ’s and general goings on.